Imagine someone getting access to your computer, encrypting all your family photos and other priceless files, and then demanding a ransom for their safe return. That is what ransomware is all about. Symantec’s latest research report suggests police-themed ransomware could be a replacement to the once-lucrative fake antivirus scareware trade. According to report, Ransomware distributors are raking in around $5 million dollars a year and the spoils are being spread among just 16 crime groups. Symantec’s estimates suggest a significant but not yet thriving crime business, which delivers each operation, on average, $300,000 a year. Reticently identified Oracle Java SE Remote Java Run time Environment vulnerability ( CVE-2012-5076 ) leads to Geo located Ransomware Malware. Java vulnerability actually can allows attacker to unauthorized disclosure of information, unauthorized modification and disruption of service. 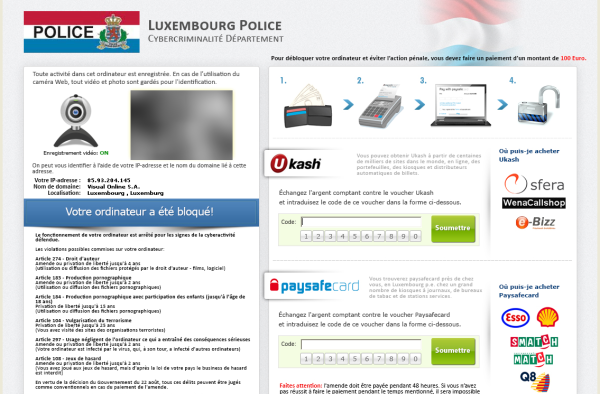 This Ransomware shows a bogus notification, that pretends to be from the their local Police Department, that your computer has been blocked due to it being involved with the distribution of pornographic material, SPAM and copyrighted content. So, Police virus will lock you out of your computer and applications. This vulnerability can be exploited over multiple protocols and affects versions are 7 Update 7. The Police Ransom is a scam and you should ignore any alert that this malicious software might generate and remove this Trojan ransomware from your computer using a good antivirus product. Under no circumstance should you send any money to this cyber criminals,as this could lead to identity theft,and if you have, you should contact your credit card company and dispute the charge stating that the program is a scam and a computer virus.